It’s Friday and I’m linking up again for the #SummerBlogSocial! I read over the prompts again and again, undecided which one to pick. And finally a few thoughts came to me and I knew which I wanted to do. Yes, I know that almost everyone has done that one but hoping mine will have a bit of information that someone will find useful. Of course now that I think about it some of my thoughts pertain to this prompt as well. So when I started blogging there is a lot that I wish I knew and these are things that I would pass on to anyone who told me that they were interested in starting a blog of their own. So lets get this list started! 1. If you don’t have any knowledge of HTML or CSS then read! There are a lot of great resources out there for you to learn and a good one that I’ve used when in college is the W3 Schools Online Tutorials. Making buttons, header images, and adding widgets to you blog can all require some knowledge of basic web development skills. So read up! 2. Find your color palette. By this I mean figure out the main color that you want to use in your blog and then use a color palette finder like Big Huge Labs. With a tool like this you can be sure that all the colors that you use coordinate really well. 3. Pay attention to the layout & design of you blog because if it’s to busy or have contrasting colors/patterns you will start to turn your readers away. Do a little research on layout, design, and some basic usability practices. This is a great article by Jakob Nielsen, a leader in the usability field. 4. Plan. Planning is important and knowing what you want to write about and what your want your blog to be about. Otherwise you can end up aimless and won’t have the direction you need to help you grow your blog the way you want it. 5. Don’t expect miracles. It takes time and hard work to get lots of followers and comments. This is something that I’ve struggled with and was worried about on and off time and again… because I was never sure if I did something wrong or said something to offend people. What I learned is that it’s not always me or what I write and that I just have to put forth a bit more effort. 6. This one naturally follows the previous one. Content is really important. You need to post on a regular schedule and what you write needs to be good. A good subject that is well thought out and well written will get noticed. This is an area that I feel that I’m lacking in and have really made it priority to work on it. 7. Now this one is really important. Be honest. Be true to yourself. And most of all do not steal other peoples content! This will get you shunned and pretty much kicked out of the blogging world faster than you can blink. 8. Find a community that you like and fits what your blog is about. There are so many great ones out there than are really supportive of bloggers that picking one will actually be the most difficult part! I know that at first I joined all sorts of them left and right and tried to keep up and take part in all of them. I quickly found out that it was nearly impossible to do that so I sorted out the ones that helped & the ones that didn’t and today I’m part of the SITS Girls, Blog Frog, and a couple others. 9. Have fun!! Blogging and social media is a ton of fun even with all of the work that’s involved with it. Take the time to enjoy it, make friends, and if you need to take a break once in a while. It’ll all still be there when you come back and you’ll be welcomed with open arms again. 10. Ask for help if you need it. Chances are there will be someone out there that knows the answer or can help you solve your problem. There are countless number of times that I’ve asked for help, offered to help others, and been asked to help. It’s great knowing that you’ve solved someone’s issue and that they’ll return the favor in the future. Goals. We all have them, right? 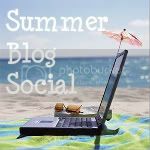 Well today we’re going to discuss my blogging goals for the Summer Blog Social that is being hosted by Liz from a belle, a bean, and a chicago dog and Jessica from Four Plus an Angel. So there’s a specific prompt…. What are your overriding goals for your blog and social media presence? How have those goals evolved over time? I can most certainly tell you that when I started out just over a year ago I had no goals. None. I didn’t really have a clue what I was doing and just hoping for the best. And I learned a great deal! Wow… I seriously couldn’t believe how much there was to this blogging thing. Numbers, stats, commenting, Google Analytics, mingling, joining groups, reviews, giveaways… the list seemed endless of all the things that you could take into account where blogging is concerned so many directions that you could go with it all. But now that I look back what it comes down to is what you really want to do with your blog, where you want to take it, and most importantly having fun with what you decide to do. So I love this blogging & social media thing. Being able to meet new people and interact with them on a daily basis is great. I’ve met so many people and it amazes me everyday how helping and generous they all are with their time and knowledge. Not that long ago I decided that social media is something that I would love to be able to do all the time and some day I want to be doing this for a living. Blogging & social media as my official career is my goal. Is it a lofty goal? Maybe, but I think that it is one that is definitely obtainable. I just need to get pointed in the right direction and with help I believe that I can make it happen. The first couple things that I am doing to get closer to that is increase my content ensuring that it’s good content too. Next on the list is getting more organized when it comes to blogging and my posting schedule. Easy peasy! I’ve been doing it for almost a week now! Yay me! So there you have friends, my goal. Just one to make it easy on myself. What do you think? Any suggestions on where or how to start?